The Right Fit: If you’re feeling left behind in fitness-forward WNC. Don’t. It’s not about who wins the race or who’s the most flexible yogi. Exercise is about finding an activity that moves your body and spirit. Check out this beginners' guide to get you hooked on cycling, running, or yoga, complete with inspiration from three folks who’ve already found what they love to do. Kimberly Masters has breezed by more landscapes on the seat of her bike than most people take in through their car window. On two wheels, she’s explored Alaska, traveled up the coast of California, pedaled from North Carolina to Florida and then to Arizona, conquered the landscapes of Nepal, Italy, and the Tetons, and cruised through Martha’s Vineyard and the Finger Lakes area of New York. For 12 years, she’s led cycling excursions for WomanTours based in Rochester, New York, though she makes her home in Asheville. On these trips, her role varies from cruise director to backcountry cook. In Alaska, Masters sets up tents, filters water, and whips up meals, taking care of the cyclists’ basic needs. Then she leads them through the wilderness on two wheels, forever altering their, and her, views on life. The tours cater to riders of all abilities. While some women sign up to ride 100 miles a day, others take it easier, gliding down hills in the saddle and enjoying the scenery from the seat of a van on the tougher stretches. Masters makes it all happen, complete with encouraging words. Of all the wondrous places she’s visited, she lives in Western North Carolina because she considers it the most magical. For her, this East Coast mecca for cyclists is also the place where people gather to create art, make music, and reconnect with the planet and themselves. It’s also a great home for her luxury, handcrafted-soap company, Essential Journeys. The name of her business and its logo, a woman lounging across the handlebars of a town bike, best describe and depict her attitude in life and appreciation for the outdoors. Visit www.womantours.com to sign up for an adventure. Whether you shed the training wheels at age three or 73, bicycling is a heart-healthy sport that keeps giving. It increases cardiovascular health by improving circulation and keeps the heart strong. 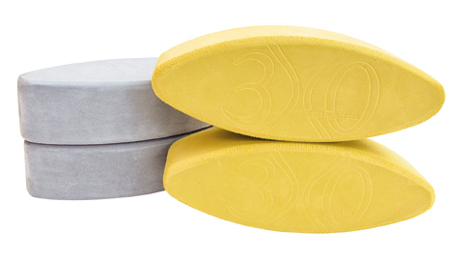 It’s a great tool for rehabilitating problem knees and hips by strengthening and balancing the surrounding muscles. Pedaling’s gentle range of motion keeps joints lubricated without overstraining them. Aside from the scientific reasons to ride, it’s a sport that puts a smile on your face and lifts the spirit. 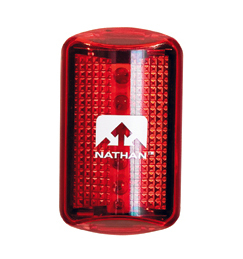 Warm up for 15 minutes before any steep climb by pedaling through rolling or flatterrain. Once climbing, drop down into a gear that allows you to keep a good cadence, maintaining constant pressure on the pedals. If your hips are bouncing, gear up. Change gears as needed so you’re maximizing your effort into forward motion. For example, shift into a harder gear whenever the hill dips; momentum is your friend. Gear down again before the pedaling becomes too difficult in the next steep section. When it getsreally tough, sit on the nose of the saddle. Spin the pedals, rather than mashing them down. Stand up in the pedals in the final 100 feet of the incline. The Right Ride: “You need a bike that fits you properly, otherwise biking is agony,” says Mike Noonan of BioWheels in Asheville. That’s why it’s wise to go to a shop for your ride, rather than buying used wheels online. Staff can help you find the correct size and make fine adjustments to suit your frame. Often, maintenance packages are available, which can save you money in the long run. Shorts: It’s a good rule to spend more on padded cycling shorts than a jersey, especially if you plan to spend a lot of time in the saddle. Your rear end will thank you. Helmet: Prices range from $45 to $245, but all offer the same level of protection. With pricier helmets, the extra dough goes toward snazzier styling and better ventilation. Repair Class: The more you know about how your bike works the more comfortable you’ll be pedaling. Many bike stores offer classes on the basics of repair, so sign up. Asheville Pedal Punks This casual group meets up for leisurely 10-mile rides in Asheville at 3:30 p.m. the first and third Sunday of each month (4:30 p.m. beginning in spring). Visit www.ashevillepedalpunks.blogspot.com or check the group’s Facebook page to confirm rides. For more clubs, visit www.ncdot.org/bikeped/bicycle/bikeclubs. Mike Noonan of BioWheels likes to outfit new riders with tire replacement kits. “Riding by yourself is easier when you know you have a way to get back home,” he says. 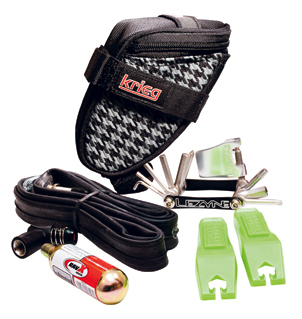 This à la carte kit from the Asheville shop includes a Krieg saddle bag ($25), replacement tube ($6.50), Pedro’s tire levers ($4 for two), and RavX Design CO2 mini inflation set ($17.50). Add a Lezyne V10 Mini-tool ($35), which includes a Phillips screwdriver and Torx wrenches. $ A new or used bike for the novice can cost $400 to $1,000. $ $ A new or used bike for the weekly rider ranges from $800 to $2,000. $ $ $ Top-of-the-line mountain and road bikes run as much as $11,000. If you’re rusty on the rules of the road, sign up for a Biking 101 class in Asheville. Certified instructors will brush up your skills with refreshers on weaving around obstacles, handling traffic situations, and changing a tire. For class dates, e-mail buncombebikeed@gmail.com. One might expect a conversation with an ultra-marathon runner to center on the best shoes and goos, course terrain, record times, and upcoming races. But Danny Dreyer would rather talk about energy. “When you feel good, it’s energy moving through your body. People try to make it more complicated, but fitness does not equal strength. Fitness equals energy moving through your body,” he explains. That’s the theory that propels Chi Living, the company he cofounded with his wife, Katherine, to share his techniques for walking and running based on the principles of tai chi. The program, which focuses on pain-free movement, is creating new runners and giving injured or burned-out veterans a second wind. People from all over the world attend his workshops, which bounce him across the country. Plenty of people are ready for the lesson. Virginia Tech is considering the program to condition 1,000 pre-military cadets as well as adding it as a class, and the Lifetime Channel is using the Chi Walk-Run teachings as part of a lifestyle makeover for four women whose stories will air on The Balancing Act in January. Danny’s latest book, Chi Marathon, comes out in March. This annual workshop is for walkers to advanced runners and includes instruction by Danny and Katherine Dreyer and certified instructors. $1,720-$1,990. For more details, visit www.chiliving.com. This year, the club is hosting two 12-week sessions to prepare beginners for 5Ks. The programs are designed for newbies and those overcoming injuries and start slow, alternating walking and running to build endurance. Training for the Ramble Run 5K starts the week of February 20. Those who want to finish the Bele Chere 5K on July 25 begin workouts the week of May 7. This Hendersonville group, which welcomes runners of all ages and seeks to encourage families in the sport, hosts weekly Saturday runs at rotating locations. The beginners’ group is mentored by an experienced runner and tackles one- to two-mile routes. There are also intermediate and advanced groups. It’s $10 for individuals and $15 for families to become members, which includes discounts at local running shops. The Roadrunners meet at 4 p.m. Monday through Thursday during the winter and at 9 a.m. Saturdays at Town Hall for longer runs. Members range from beginners to folks who’ve conquered the Boston Marathon. Visitors are welcome. Runners and walkers can train for races or for fun with this group that practices in Tryon, Saluda, Columbus, and Landrum, South Carolina. Hook up with them to get ready for the Warrior Drive 5 Mile on March 17. Group strides take place on Saturdays at varying locations. The Chi Running technique for going vertical without expending all your energy is called e-chi. 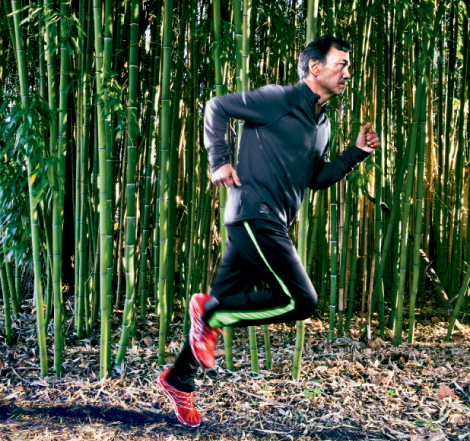 Shorten your stride, but maintain your cadence. Make sure your arms swing straight ahead, not across your chest. Let your eyes draw your energy forward by concentrating your gaze on an object at the top of the incline. “Pretend like it’s the most attractive thing in the world, whether it’s a fire hydrant, streetlight, or Volkswagen,” says Danny Dreyer. Focus is the key. Showing up for a race unprepared is the easiest way to quash your newfound love for running. If you’re taking on your first 5K, you’ll need eight to 10 weeks of training. Invest 12 to 15 weeks for a 10K, six months for a half-marathon, and six more for a marathon. We’re not exaggerating when we say there’s a race every weekend in WNC. Here are just a few to enter in 2012. The Asheville Citizen-Times Half Marathon course is known for its hills. Registration begins March 1; race day is September 15, www.citizen-times.com/section/race. Others include Valley of the Lilies Half & 5K in Cullowhee, March 25, www.wcu.edu/28180.asp; New River Marathon & Half-Marathon in Todd, May 5, www.newrivermarathon.com; Bethel Half-Marathon in Canton, October, www.bethelrural.org; and Kickin’ Asphalt Half Marathon in Murphy, November, www.kickinasphalthalf.com. If you’re just getting started, don’t pull out those Keds from 2003. The right running shoe is key and the best place to get fitted is at a shop that can analyze your stride. Specialized stores, such as FootRx and Jus’ Running in Asheville, use treadmills so staff can determine your foot strike. "I go to the yoga mat to heal,” says Kathie Billing, a woman with striking blue eyes and an air of calm in her voice. The Boone-based mother, wife, and yoga instructor helps others do the same. The healing Billing shares goes beyond the typical yoga practice of improving flexibility, strengthening the body, and soothing the mind. Her experience as a registered nurse, coupled with three bouts with cancer, uniquely qualify her to work with women affected by the disease. In 2003, Billing was diagnosed with melanoma, breast, and uterine cancers, and spent more than a year receiving treatment. The athletic mother and wife had run a marathon just a year before. Following surgery, chemotherapy, and more surgery, Billing turned to yoga as an alternative therapy. “Oncologists don’t often recommend fitness as part of cancer treatment. But from a nursing standpoint, I think it should be part of the prescription,” she says. “Medical studies show that yoga is good for helping beat cancer and other ailments.” Billing found that gentle yoga helped stretch her scar tissue while increasing mobility in her chest and arms. More importantly, the practice gave her a safe and quiet space to free her emotions and overcome fears. She earned her teaching certification three years ago, first working with breast cancer patients, and now all women. “I wanted to offer classes to people who are shy about walking into a yoga studio, as well as people with health issues,” she says. Billing teaches gentle and yin yoga styles (a passive practice that targets connective tissues) at Neighborhood Yoga in Boone and Westglow Resort & Spa in Blowing Rock. She also holds certifications in breast cancer Pilates, aquatic arthritis therapy, and cancer massage. She’s furthered her mission by working with the Pink Ribbon Program, which offers Pilates for breast cancer patients, and founding Soul Moving Yoga, her current wellness offering for women, which she teaches through Pilates Studio of Boone. With more than 20 styles of yoga and loads of classes locally, it can be challenging to figure out where to start. The good thing is, even if you don’t find your favorite class the first time, all is not lost. As Stephanie Keach, instructor, teacher trainer, and founder of the Asheville Yoga Center, explains, “Moving and breathing is always good.” Here are points to consider before you roll out a mat. Ask yourself what you want to gain from yoga. Are you looking to relieve arthritis? Cross-train for a race? Lower your stress level? Increase mobility? Or perhaps you want a vigorous, strengthening workout. There are classes that address each of those needs. Yoga involves physical poses called asanas, breathing techniques, and often meditation, yet each style is different. So a bit of research on your part to learn the difference between restorative (passive stretches with the use of supportive props) Iyengar (alignment based), and Vinyasa (fast-paced with breath-synchronization) will go a long way. If you think you’re too fit for an entry-level class, think again. You won’t gain the benefits if you don’t learn proper alignment for the poses. Beginner classes take you through the basics at a slower pace, so you can learn to breath through all the kinks and gain a greater awareness of your physical strengths and weaknesses. It’s a good idea to show up early for class and chat with the teacher. They can steer you in the right direction. Lighten Up Yoga in Asheville (www.lightenupyoga.com) offers a free consultation to get you matched with the appropriate classes and instructors. Keach recommends attending classes by many teachers, because everyone instructs differently. Often, studios assist by offering the first class for free, discounted rates, or the occasional free weekend to welcome newcomers. Downward Facing Dog is a basic pose, but it’s harder than it looks. It lengthens the spine, stretches the hamstrings and calves, and strengthens the upper body. When done correctly, with the spine in alignment, it calms the nervous system. Try it with these instructions from Cindy Dollar, owner of One Center Yoga in Asheville and author of Yoga Your Way. On a nonslip surface, begin in a tabletop position—knees directly under your hips and hands under your shoulders. 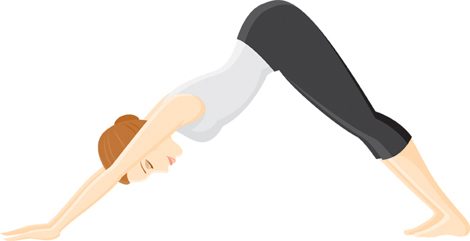 Curl your toes under and lift your hips in the air. Straighten your legs, firm the thighs, and press your hands firmly into the floor to straighten your arms. Keep your head and neck relaxed. It’s OK if your heels aren’t on the floor; the stretch comes from getting your hips high in the air and creating a straight line from your heels to hips, and hips to hands. Hold the position through five long, deep breaths. At Asheville Yoga Center, Brightwater Yoga in Hendersonville, and Sylva Yoga, your first class is free.